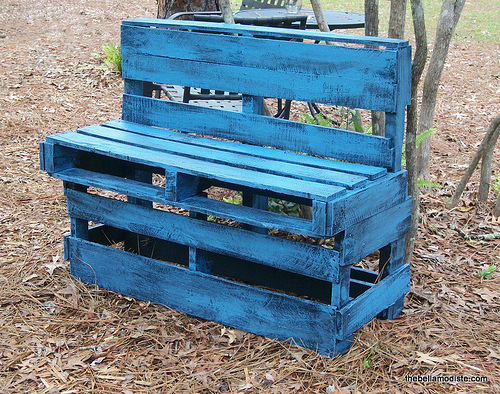 I picked up a few more pallets after building my potting bench, because- well, I could. They were just sitting there at the construction site, waiting to be discarded. So I walked on site, talked to the supervisor, got permission to take some. Brought two pallets home, and the next day set to work cutting and planning (because my best projects are planned while I do them, not before). I decide how I want it to look, and figure out how to get it to look that way while I’m making it. There are no sketches, no measured plans, I just do it. So from one pallet, and a scrap leftover from the potting bench(the seat of the bench was the end of the pallet I used for the front of the potting bench), I cobbled together a bench to match the potting bench. It was one of those days that I didn’t even think to take step by step pictures, so all I’ve got(again), is the “before paint”, and “after paint” photos. I’ll do better next time! Last weekend, my grandfather, my father, and I went back up there, picked up a couple of electrical spools, and 6 more pallets. Two days later, granddad brought me another 6 pallets. We have some thoughts on what to do with two of the reels, and a few of the pallets(can we say Awesome Wagon Fort for “the kids”(*cough*me*cough*)? Heck yes! ), but do you have any ideas on what to make with oh..you know, 3 huge electrical spools, and 13 pallets? I’m planning on disassembling a number of the pallets, just for the wood, and to make storage of it all, take less space. Wow! You are sooo creative! Did your father teach you how to build things? This bench is so adorable. Do you know how to make couches and loveseats, too? If so, that is totally awesome!